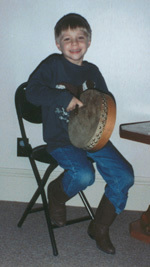 Our son, Cullen (age 3) with his first bodhrán (1995). 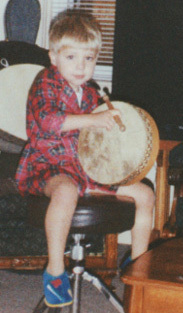 (from his Nee Ningy Days) forming the group "100th Monkey." 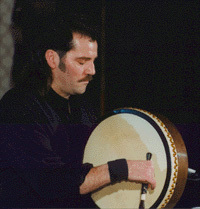 with bodhrán and harmonica on Mance's 1995 self-titled album. 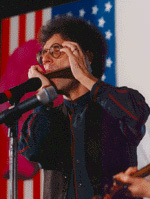 Here they're at it again during a performance. 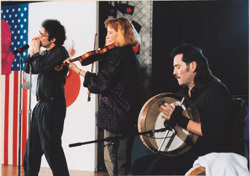 (L-R) Tom Perrotti (guitar), Jack Wright (fiddle), Phil Edmonds (whistles), Mance (percussion). 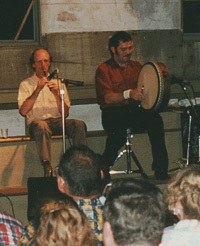 Mance and Phil, together again. I am very pleased to send my warmest good wishes to the Newport Historical Society for the success of their project, "A State of Hope: Irish Immigration to Rhode Island." While many have left Ireland over the centuries, there can be no doubt that the Great Famine which started in Ireland 150 years ago, was a major focal point in the history of Irish emigration. The Newport Historical Society project is significant as it concentrates on the letters between emigrants and their families in Ireland, in assessing the impact of the Famine. These letters, while presenting historians with many challenges in their interpretation, are and have been tangible links between emigrants, their descendants and their Irish heritage. As sources of historical research, they offer accounts of personal experiences which, while originally intended for limited circulation, can be measured against contemporary media reports to give a more complete picture of the people who lived in those troubled years. I commend the Newport Historical Society on this interesting and timely project.